On the upside, at least there's a plan. So, after running around southern Ontario (and buying THE most AMAZING sparkly ballet flats, which I'll show off in a separate post because that's just how awesome they are), I finally flew back home. My Mum got us a room at the airport hotel and since she travels so often, we stayed on the Executive floor. That doesn't really mean much except that there's complimentary breakfast in the morning and free Wi-fi. I'd expected the breakfast to be a bowl of fruit and maybe a muffin, so I wasn't too excited, but I was wrong. It was basically the greatest breakfast buffet ever. I haven't been to a buffet in years (as germ contamination is QUITE HIGH) but we were there right when it opened - 5:30am - and nobody was there but us. 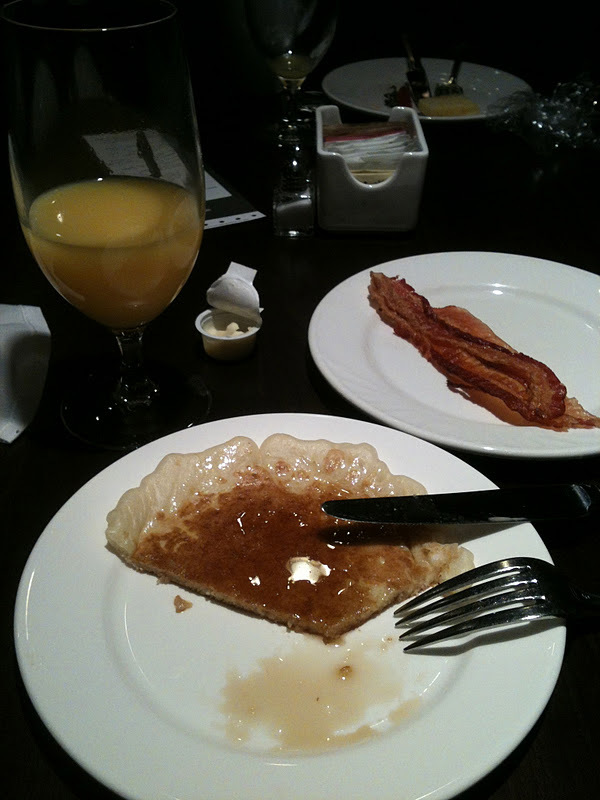 I wandered through the offerings and found some freshly sliced fruit, orange juice and bacon. Truth be told, I wasn't aware there was bacon until my Mum pointed it out, but then I was all about it. However, this post isn't about standard buffet breakfast fare. This post is about the most amazing thing I've ever seen. In my wildest dreams, I never would have thought something like this existed. 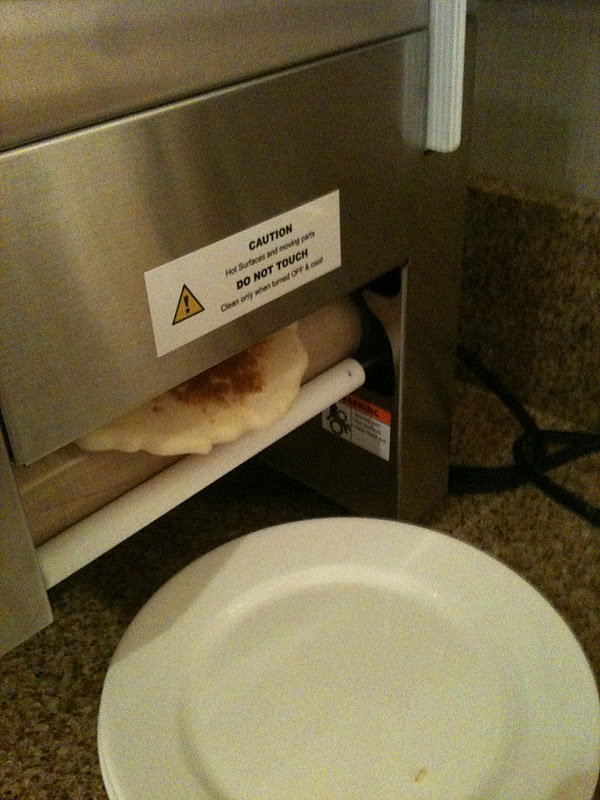 It's an AUTOMATIC PANCAKE MACHINE!!! Say what? Yeah. It's true. 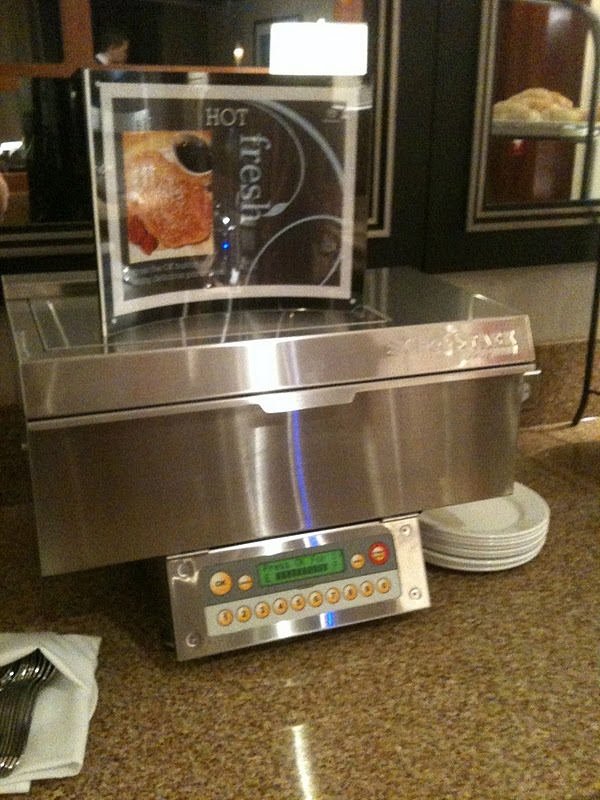 This is an automated pancake machine, aptly named the ChefStack. First, choose how many pancakes you'd like. I wasn't sure how this was all going to go down, so I chose one to start. 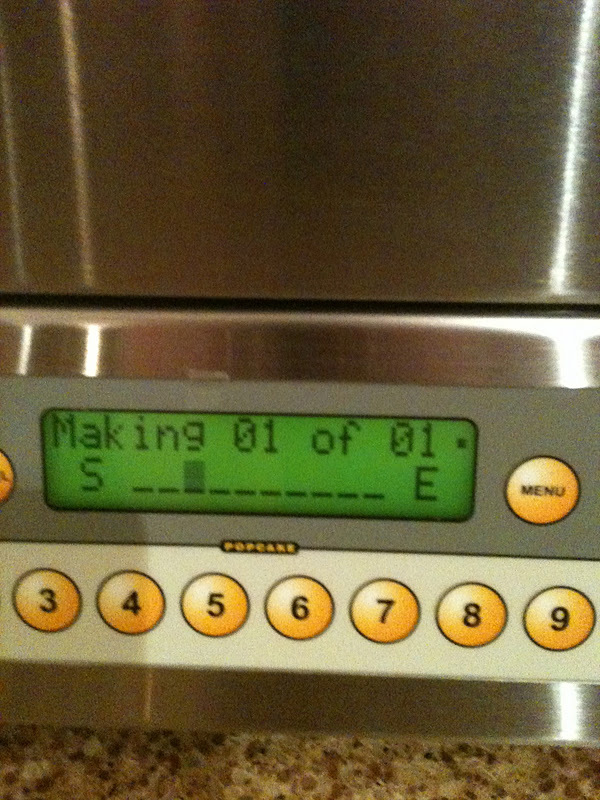 It whirls for a moment and then gives you a countdown. On average, it takes about 90 seconds per pancake. Then, get your plate ready! Cause it rolls out the other side, perfectly browned! 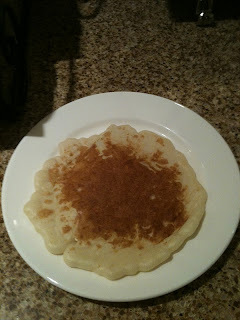 PLUS, it was basically as thin as a crepe. I HATE thick pancakes because sometimes the batter isn't cooked all the way through. But the ChefStack produces high-quality and FAT FREE and BARELY THERE cakes! So if you have an extra $3,500 lying around (as I'm sure the majority of you do, I mean, who doesn't - ha) - I'd recommend that you pick one up IMMEDIATELY! Personally, I'm going to wait it out a bit, but that won't stop me from dreaming of the the almost-paper-thin pancakes that require no cleanup or prep. Whenever I have to go back, I'll be looking forward to the unexpected silver lining. And what a delectable silver lining it is. 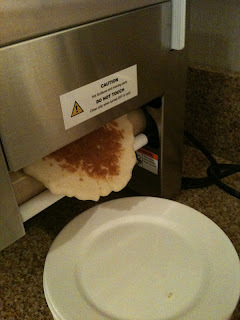 A pancake machine? Who would've thunk?? I didn't know you were sick, though, Jennie. I think I missed something. I hope you are able to overcome whatever it is you are facing very soon and super easily! Best wishes, Blog Buddy! Julie, you're just adorable. Thanks for the well wishes!